..experienced across sectors and cultures. In collaboration with Will Hutton, CEO of The Work Foundation, EDG has provided a series of innovation workshops to inspire and skill the creative sector so they can better respond to changing and increasing complex consumer demands. Whilst innovation is seen as a route to competitive advantage, most businesses do not have clearly deﬁned innovation processes. The workshop was designed for chief executives, directors, business leaders and senior managers interested in learning how a structured approach to innovation can help them respond to the changing and increasingly complex consumer demands. The workshops gave participants an understanding of how today’s customer is being transformed and the practical implications this has for the value propositions their companies must offer. 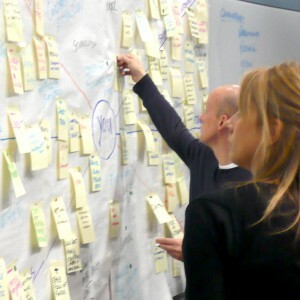 Participants integrated theory and practice through the application of innovation best practices to their own projects. The questioning techniques we used enabled them to become better skilled at evaluating the quality of a new idea. They received tools and techniques for developing their own ideas to their full potential and a proven method for dramatically increasing the chance of your idea being accepted. This entry was written by Karien Stroucken, posted on February 7, 2009 at 15:08, filed under Projects. Bookmark the permalink. Follow any comments here with the RSS feed for this post. Both comments and trackbacks are currently closed.